Just as an option, you could probably order the mounts straight from Jardine's factory. I bought other (odd) replacement parts for my set of hi-mounts from them, and I'm confident they sell any components (even rivets) . Could be expensive thou, may be cheaper DIY if you don't care for the look. 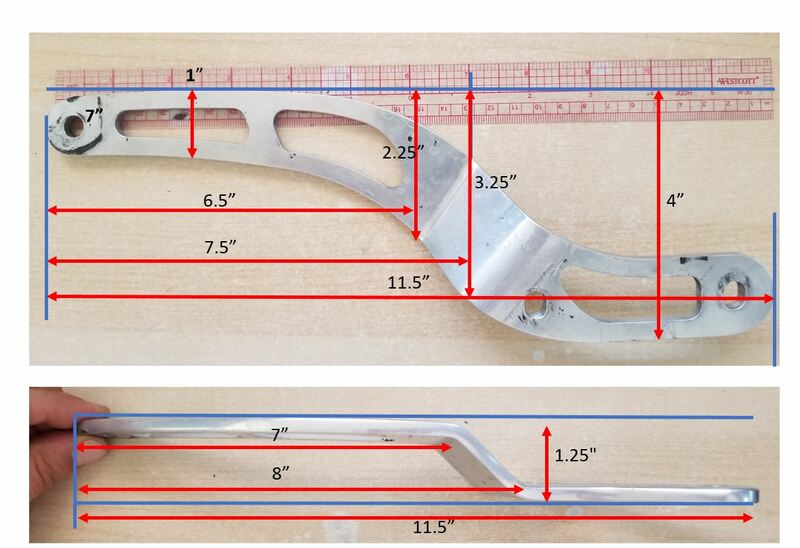 I recall some users here fabricating their own out of aluminium sheet+some cutting/drilling+2 bends. I didn't see anything for the VTR on their site (or two brothers, or any other manufacturer that I liked), but I had thought about reaching out. I've also been kicking some designs around in my head for a DIY option. I guess I'm holding out hope that someone wants to get rid of a set on the cheap... Fingers crossed. Call them on the phone. I got parts from Jardine when I had RT-1s that were listed unavailable. Not a sure thing, but worth a try. ^+1 Yeah, you got to call them directly. Ask for the sales dept. Thank you for your interest in Jardine. Sorry to say that we do not produce this system nor do we produce the hardware that came with it. I checked around and we do not have any high mount hangers for Honda hanging around anymore either. Damn. Sorry dude. They used to be a small company very customers oriented. I even picked up parts at their HQ when it was in Fontana, CA. That was 7-8 yrs ago. Just found out on Google that SuperTrapp bought them in 2012. They are now in Cleveland, OH. Last edited by Killemall; 07-08-2017 at 10:00 AM. Thanks very much for that! Somehow in all my searching, I hadn't seen it yet. I like that design... Gotta get some aluminum. No problem. Looks like they need the rear pegs mounted to fit thou. I would make something similar but to mount like the OEM. So you have the option to take on/off the passenger pegs. It should be quite straight forward. I can take some measurements off the OEM bracket if you need them. Try also a Google search for something like " Jardine rt-1 custom mounting brackets" or similar. You'll get some hits also from VTR1000.org and other forums of bikes that mount the Rt-1. It may give you ideas. I can take some measurements off the OEM bracket if you need them. Take a look. They are approx. measurements, but i can take more if you need them. They quit producing the exhaust in 2003 I was told. The replacement parts for them were clearanced out through their distributors for next to nothing. I've got a set of the exhaust off mine but have managed to lose the hangers and hardware over past 15years. I bought flat aluminum sheeting from a local hardware store am going to just cut my own from plate then use thick wall aluminum tubing to cut my spacers from. You will just have to play with the thickness because of the Jardine hanger offset. It's not that bad to do if you are patient. A good source for scrap aluminum pieces is a local welding shop that specializes in fabricating. They will usually sell you stuff for a few bucks as it is more than they will get for it at salvage. 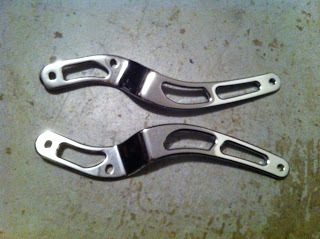 FS: High mount exhaust brackets.